The Supreme Court today held that the allegations made by Kamini Jaiswal and Prashant Bhushan against Chief Justice Dipak Misra was "derogatory and contemptuous" but desisted from initiating contempt proceedings "in the hope that goodwill will prevail". The three judge bench dismissed the plea seeking SIT probe into possible role of sitting HC and SC judges on grounds of impropriety like "forum shopping" and contempt. "Allegations are derogatory and contemptuous but we are not initiating contempt as we hope better sense will prevail..let us all work together for the welfare of this great institution..we are dismissing this petition with the hope that matter ends here", Justice Arun Mishra said reading out the operative portion of the order. The seven main observations made by bench of Justice R K Agrawal, A M Khanwilkar and Mishra. 3) It is a clear case of forum shopping. It was not proper to file second petition. Bench of Justice Chelameswar was unaware of the similar petition pending before Justice Sikri's court. This non revelation is clearly unethical. 4)CJI competent to assign matters to any bench. Request to justice Khanwilkar to recuse is deprecated. 6) On the date and time mentioned in FIR when bribe exchanged, no matter was pending in the court. A three judge bench comprising Justice R.K. Agarwal, Justice A.K. Mishra and Justice A M Khanwilkar was pronouncing its verdict on maintainability and propriety of Ms. Kamini Jaiswal's plea for probe into role of members of the higher judiciary in a matter relating to “illegal” permission to a debarred medical college to function. Yesterday, during a one and a half hour stormy hearing, Justice Mishra said that the bench would clarify whether filing of two petitions with identical facts amounted to forum hunting and whether the allegations made against the Chief Justice amounted to contempt. Justice Mishra had said that prima facie the allegations amounted to a deliberate attempt to scandalize the institution and denigrate the system. “The allegations were a deliberate attempt to scandalize this great institution. it has denigrated the system. The damage has already been done. Everybody now doubts the Supreme Court that too, merely on the basis of rumors spread. How do we repair this damage?” the CJI had asked. 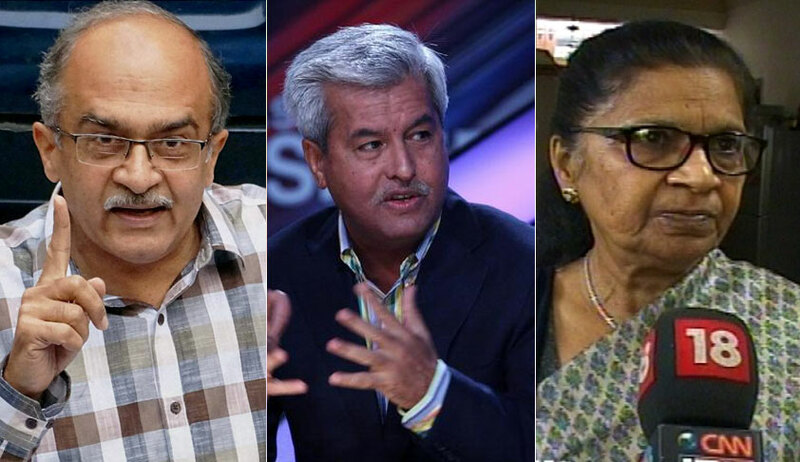 Raising strong suspicion of “forum shopping”, Justice Mishra had further commented, "you (Prashant Bhushan) knew on Thursday that a petition making identical allegations against the CJI filed by your group (CJAR) was pending before a bench headed by Justice Sikri. Despite that, you filed another petition and insisted it to be heard on the same day by court No.2 (Justice Chelameswar). This is both contempt and forum shopping sir." The FIR in the case is being probed by the Central Bureau of Investigation (CBI). It has been alleged that a conspiracy was hatched by certain persons, including a former Orissa High Court Judge I.M. Quddusi to bribe SC judges hearing the case of a debarred private medical college. Noted Advocates Shanti Bhushan and Prashant Bhushan, who argued for Ms. Jaiswal, had denied that any charge was leveled against the CJI. "No direct allegations were made against the CJI. A wrong impression is being given," they had argued. They had, however, justified their stand that the CJI needed to be kept away from the two petitions asserting that the allegations contained in CBI’s FIR were “serious and grave”. They had further argued that since the CBI case had led to the arrest of a former Judge of the Orissa High Court and the conspiracy revealed attempts to influence proceedings before a bench headed by the CJI, it was absolutely essential to keep the CJI out of the two petitions, both judicially and administratively. We had only said that much and nothing else, they had clarified.